The poet Alfred, Lord Tennyson asked if the rumour of Timbuctoo was as frail as those of ancient time. Shortly after Tennyson wrote the poem, Timbuctoo, the western world started to search for the illusive, hidden and mystical destination. Now we use the name of the city, alternately spelled as Timbuktu, Timbuctoo, Tombouctou, as a euphemism for the last place on earth one could possible travel; hence the expression “from here to Timbuktu”. In fact there are several theories about the origin of the city name, but one of the most popular seems to relate to the Berber word ‘tim’, meaning ‘In the place of’ and ‘bouctou’, meaning ‘a small dune’, and therefore the name means ‘a place covered by small dunes’. Other theories relate to the concept of ‘distance’, and the modern use of the term refers to travelling to the ends of the earth. Not a bad goal in itself. Timbuktu is a real place, but certainly not the only one in the Republic of Mali that has drawn adventure travellers to explore its bounties for many years. Mali has appealed to the motivations of all generations of travellers where the ideals of discovering new places, interacting with new cultures, experiencing the rewards of voluntourism and understanding different life styles, mix with the aspiration to travel as far outside of one’s regular daily routine (and comfort zone) as possible. Mali is a treasure book full of surprises and a place about which every travel professional should at least be aware. The current troubles in Mali are shattering, to say the least, with the average Malian suffering from the activities of the Ansar Dine rebels, in a country where the average annual salary is in the $1500.00 range. The French forces fighting the insurgents, and the neighbouring countries training to help restore and maintain unity in a country twice the size of Texas, seems to be a positive step in the restoration of the status quo, but for many the damage is done and may be irreparable in terms of families and lives disrupted, the reintroduction of foreign troops on Malian soil, cultural traditions threatened, and ancient religious structures compromised. In fact, eight of the sixteen mausoleums in Timbuctu were completely destroyed by the rebels and the doors of the Sidi Yahya Mosque, fabled to never be opened until the end of the world, were breached by the rebels. And from a tourism point of view, the loss of access to a member of the global community, even temporarily, is a blow to that country’s much-needed tourism industry. In 2010, 169,000 tourists contributed $296 million to the economy. Plans for further tourism initiatives were shelved due to the current conflict. And why should we care about Mali? For 12 years the famous Festival au Désert took place in Essakane, just outside of Timbuktu. This was a gathering of the best talents of north west Africa and showcased artists such as Ali Farka Touré and Tinariwen in an annual three day Festival. When the troubles in Mali started to manifest themselves, the annual Festival celebrating Tuareg culture and music was re-engineered as the Caravan of Artists for Peace and National Unity and in 2013, will incorporate festivals in Mauritania, Burkina Faso, Niger and Algeria. All the festivals will converge in Oursi, Burkina-Faso from February 20-22, before the grand finale in Bamako, Mali on March 1-2-3, 2013. It is one way of bringing the West Africa region together, while at the same time, strutting defiance at the idea that violence and fundamentalism will not negate the thousands of years of culture and music nor will it dampen the spirit of the people and the collective wisdom of elders, passed down through the millennia. We should care about Mali for a variety of reasons that all take into account the concept of “The Higher Ground of Travel. *"
As travel professionals it is incumbent upon us to stay one step ahead of our clients in terms of destination knowledge but also in terms of future travel trends. And all indications from the many lists of 10 top places to visit in 2013 and beyond, demonstrate a trend toward getting out of normal travel routines and looking for the ‘what else’ in travel. It could be Mali, or Ethiopia or the Maldives or North Korea or Myanmar. New directions in travel mean new learning curves for travel professionals who want to stay on the cutting edge. When the client sits in front of you and asks about Madagascar, you don’t want to subtly check Google to find out where this ‘unknown’ destination lies. You want to have at least some inkling about its whereabouts. I still remember that phone call many years ago when a senior travel counsellor called me at my office to ask if I knew where Ethiopia was located. I thought it was a quiz! It turns out that the counsellor had a client in the office, asking about the country and didn’t know a thing about the place, and so she called me. Fortunately I did a project in Grade 6 on the food crisis in Ethiopia, and therefore have known about the country for quite a while! So, from a ‘trends in travel’ point of view, it is important to know about Mali. And from the niche market perspective, covering musicology, adventure, traditions, languages, cultures, food, agri-tourism, religions, architecture and the allure of pure discovery, awe and serendipity, it is important to know about Mali. The capital city of Bamako, in which most people will enter the country, offers visitors the national museum, a national park, several markets featuring food, vegetables and the work of artisans, as well as the stepping off point for day trips covering the Niger River, the nearby Neolithic caves and local villages. But the most popular attractions are Timbuctu, Djenne and Bandiagara. Timbuctu was named as a UNESCO World Heritage site in 1988 and this heritage includes the city walls, three main mosques that comprise the ‘University’ of Timbuctu, and the Grande Marché (market). The Mosque in Djenne, constructed of mud, is one of the iconic treasures of the world with a history dating back to the 12th century. 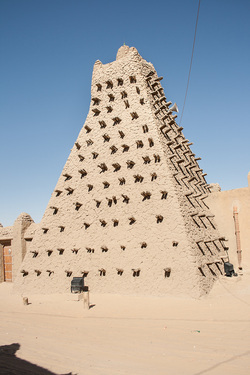 Other sites in the town include the Djenne Museum, La Maison Maiga-the ancient seat of the village chief, the House of the Three Wells and the contemplative Tomb of the Young Girl Tapama. And in Bandiagara travellers can hike along portions of the 200 km escarpment to explore and the villages and interact with the Dogon people, as well as experience the ancient mask dances. Adopting the ‘The Higher Ground*’ mentality comes with accepting responsibility for fine tuning your knowledge of everything that affects your career. As ‘mother earth’ is the product we sell, we need to get to know her on a first-name basis. Mali’s problems become our concern, as do the problems that other countries are experiencing. We think first and foremost of the plight of the local citizens but because we are travel professionals, we think of how, through tourism and education, we may be able to make a contribution to the country and, in the long run, make a positive impact on our world.